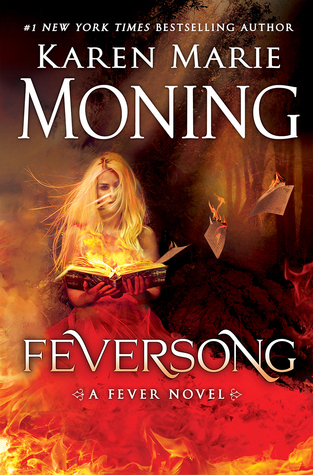 With Feversong, Karen Marie Moning dramatically drops the curtain on the Fever series. Bold and brilliantly layered, deeply emotive and all consuming, the story curves full circle as Mac and Dani try to save the world. Theirs has been a story of transformation, of finding the strength within to become who they’ve chosen to become, to wield the gifts they were given. No doubt fate has dealt them a bad hand, taken each to places dark and ugly. And in this final push, they must reach for the magic inside themselves to survive the world’s unmaking. Black holes paint the skies, ripping humanity from their place, tearing the Earth open wide. Only the Song of Making can thread together its seams. The Sinsar Dubh has possessed Mac, leaving a bloody trail across Dublin in its obsessive quest for power. Ruthlessly evil and terrifying, the Sinsar Dubh does things that ought to shatter a person irrevocably. “I am ceaseless, relentless, hungry as a tsunami. My will is stronger, my aim unencumbered, my desires greater. Trapped within the recesses of herself, Mac must fight its evil to regain control and recover the mysterious song. Her past, her insecurities, her strengths all tangle together begging to be unwound in a way where she can understand how to escape the confines of her cage. But even if Mac can best the Sinsar Dubh, the song remains a mystery, the Seelie Queen is nowhere to be found and Cruce is once again causing trouble. As the clock begins to tick its final countdown, alliances between enemies must be forged and gambles must be taken despite the potential for great loss. Sacrifices for the greater good have never been felt so deeply. The transformation of both Mac and Dani culminate in Feversong—understanding who they are, how they feel, the decisions they must make. I’ve always loved that although they are each incredibly powerful, they are also so relatable. Their sisterhood has seen tremendous ups and downs. From times of self-isolation to times they’ve stared down Death, they’ve made it out, heads held high. And of course, who they’ve loved has shaped them in ways they never could have imagined. We’ve seen the love between Barrons and his Rainbow Girl evolve throughout the series. It’s never been clearer how powerful both of them are… both Alphas ready to do what must be done. But what I thought was so beautiful, so ingenious, was seeing how in understanding their own power, their own individual strengths and gifts, they were finally able be vulnerable to each other in a way they’ve never been before. Loyal fans of the series, like me, will love every moment, every page. As one now expects from the incredibly talented Moning, gasp-inducing surprises await. Don’t forget the tissues too.